25 YEARS DESERVES A SILVER MINE! 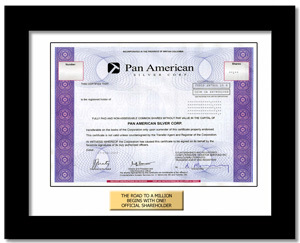 Pan American Silver Corp. is a mining company founded in 1994 in Canada. The company has mines and other projects in the USA, Mexico, Peru, Bolivia and Argentina. A very popular 25th (Silver) Anniversary Gift! Note: Registration of this stock takes 1-2 weeks longer (does not impact 1st part of 2 Part orders).